One person hospitalized after emergency landing: Rick Williams reports during Action News at Noon on April 17, 2018. PHILADELPHIA -- The NTSB confirmed one person has died as a result of the emergency landing of a Southwest Airlines plane at Philadelphia International Airport on Tuesday. "We do have information there was one fatality," NTSB Chairman Robert Sumwalt said. No further details were provided. Another 12 people were assessed by medics, officials said, and seven of those people were treated for minor injuries. A flight to paradise turned into a frightening ordeal for passengers aboard a United Airlines flight. One of the jet's two engines failed over the Pacific Ocean. Passengers are happy to be back on the ground. Southwest said there were 143 passengers and five crew members on board the Boeing 737, which was headed from New York's LaGuardia Airport to Dallas' Love Field. Most passengers walked off the plane onto the tarmac at the airport after landing around 11:20 a.m. 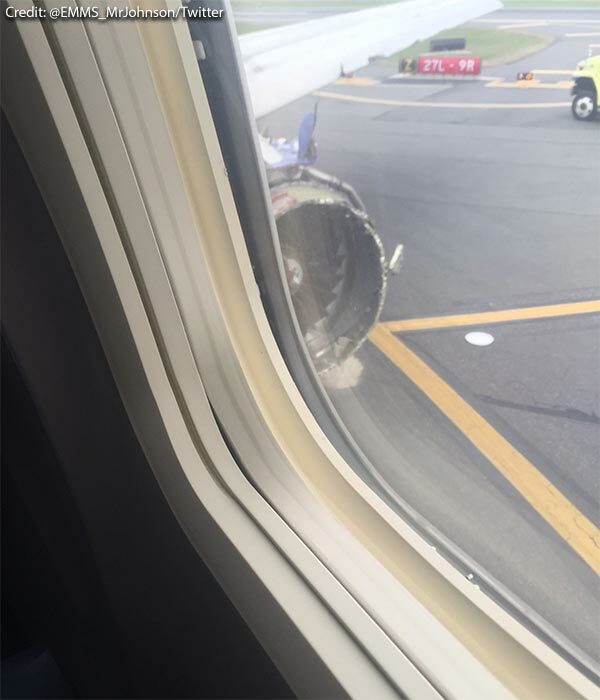 Photos taken by passengers from inside the cabin and posted on social media showed what appeared to be significant damage to the jet, with part of the covering from its left engine ripped off and a window damaged. "Right around the time there was a huge explosion and glass shattering three rows ahead of me, that was about the moment that I realized this was not going to be a normal flight," Tranchin said. Passenger Amanda Bourman told the Associated Press said she saw emergency medical workers using a defibrillator to help a woman who was taken off the plane after it landed. Passenger Matt Tranchin recalls emergency landing at Philadelphia International Airport during Action News at Noon on April 17, 2018. The New York resident said she was seated near the back of the plane and was asleep when she heard a loud noise. She said the plane was fairly quiet because everyone was wearing an oxygen mask, while some passengers were in tears and others shouted words of encouragement. The FAA said that the plane landed after the crew reported damage to one of the engines, along with the fuselage and at least one window. The Philadelphia airport tweeted that Flight 1380 "landed safely at PHL and passengers are being brought into the terminal." No other details were given. Chopper 6 VIDEO shows damaged engine, window on Southwest Airlines plane that landed in Philadelphia on April 17, 2018. Passenger Marty Martinez did a brief Facebook Live posting with the caption "Something is wrong with our plane! It appears we are going down! Emergency landing!! Southwest flight from NYC to Dallas!!" John Goglia, a former NTSB member, told the AP that investigators will take the Southwest engine apart to understand what happened and will look at maintenance records for the engine. "There's a ring around the engine that's meant to contain the engine pieces when this happens," Goglia said. "In this case it didn't. That's going to be a big focal point for the NTSB - why didn't (the ring) do its job?" Kristopher Johnson on board the flight and captured this photo of the engine upon landing at Philadelphia International Airport. The engine failure was reminiscent of a similar event on a Southwest Boeing 737-700 jet in August 2016 as it flew from New Orleans to Orlando, Florida. Shrapnel from the engine left a 5-by-16 inch hole just above the wing. Passenger oxygen masks dropped from the ceiling. Pilots landed the plane safely in Pensacola, Florida.